OK, so there’s a thin line between education and marketing. Perhaps it isn’t even a line at all. At any rate, this infographic seeks to educate small local businesses on the fact that people who shop online are not just looking for Apple, Target, and Amazon, the three main online destinations for shoppers come cyber-Monday — according to this infographic. 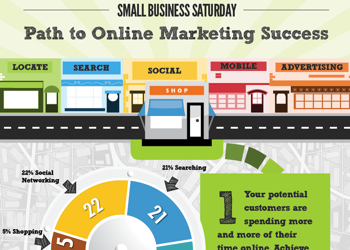 Path to Online Marketing Success is a clear sharing of statistics in a forward (downward) moving direction, encouraging small local businesses to create an online presence via web site and social media. It might be interesting to ask students to survey their local businesses for cyber presence or devise a campaign to convince.